Do kids still cover their textbooks? 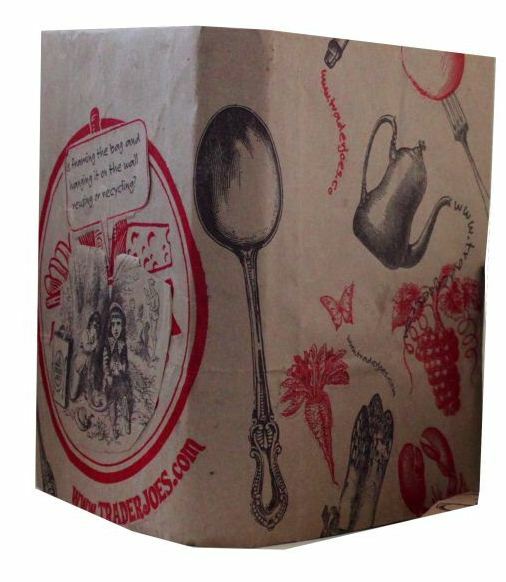 When I was in grade school I took pride in making a good cover out of the bags from the grocery story. 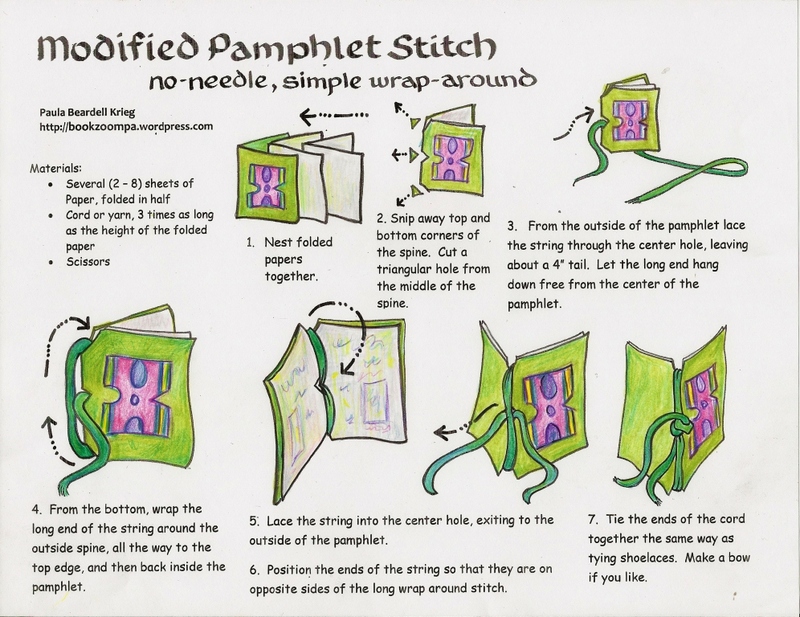 This post will cover the steps of making this cover, but the added bonus will be showing how to use these folds for handmade books. But, I want to begin with the textbook. 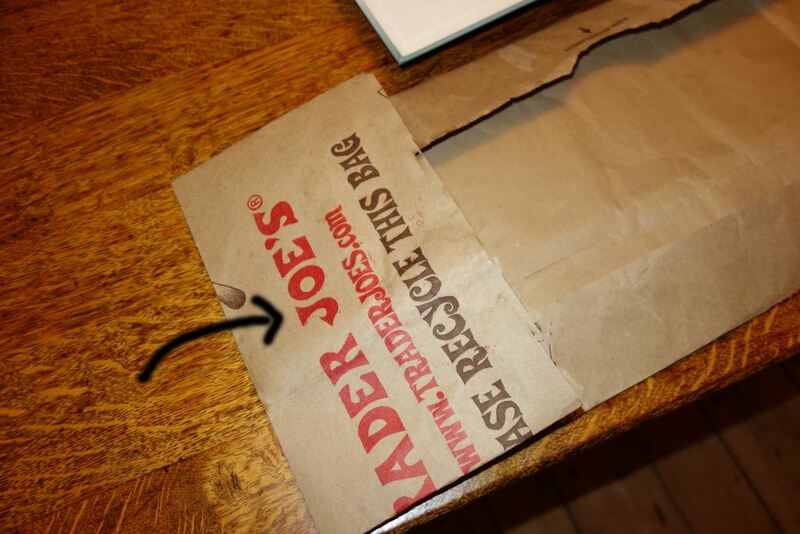 The first step is to prepare the bag my cutting off the bottom. In my day the bags came from the local Acme. 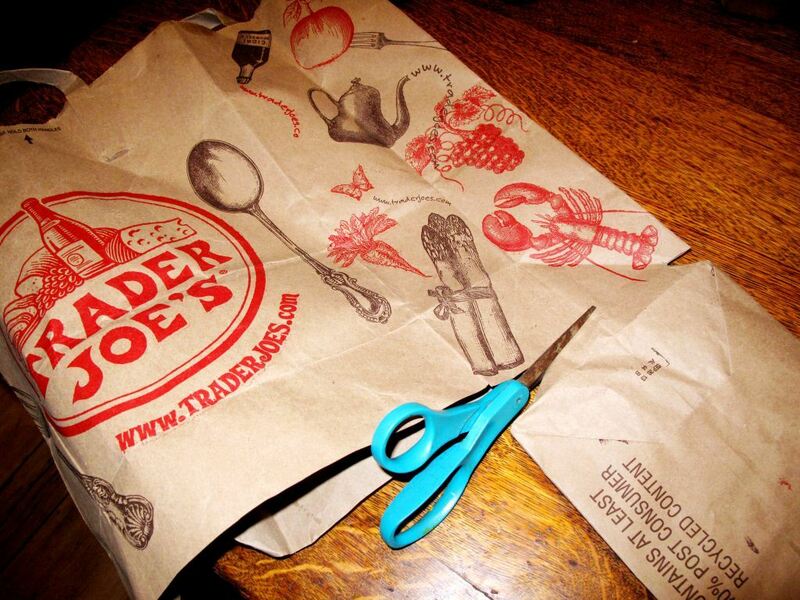 Full disclosure: even though the bag pictured here is obviously from Trader Joe’s, I am going to tell you that the closest Trader Joe’s is too far away for me ever to shop in, so this bag came to me from a friend. 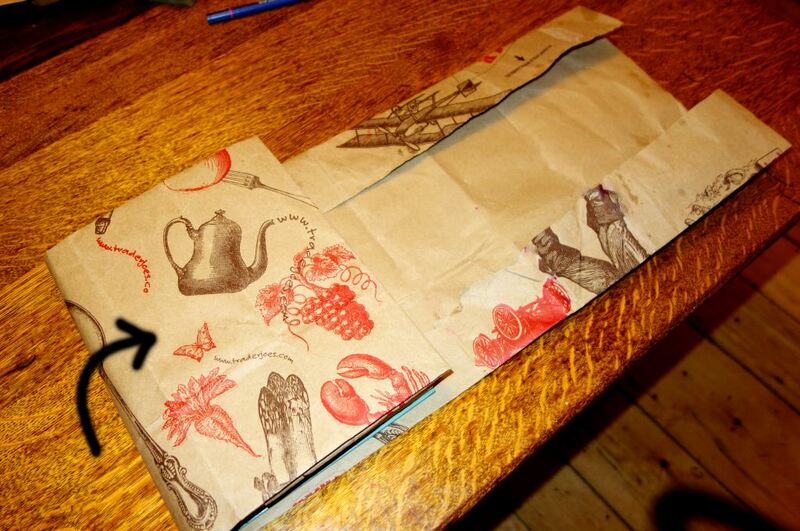 The designs printed on the bag make a great cover. I figure out ways to hide the major advertisement. Cut the bag being mindful of the how the design printed on the bag will show when the cover is done. Lay it out with the printed side down. The next will making a long fold across the bottom. 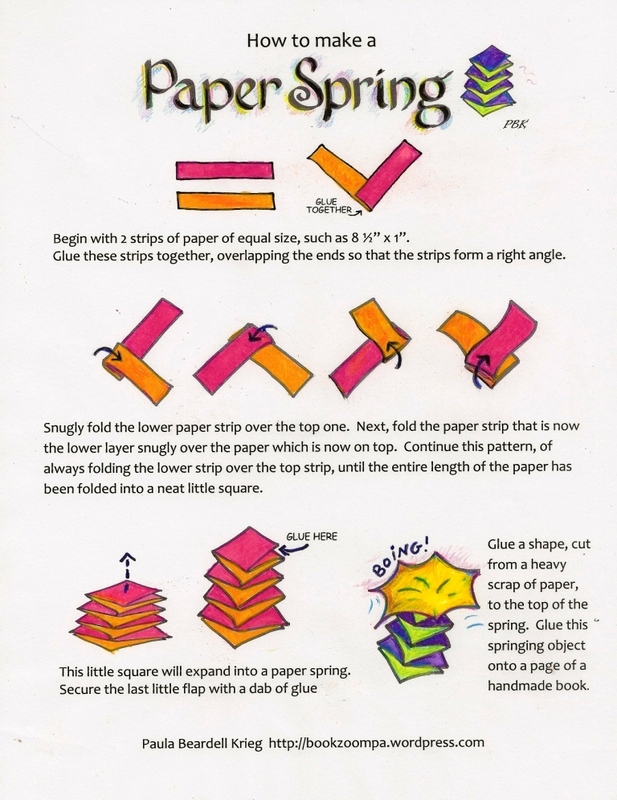 If you need help with this beyond what I show below, take a look at my post on Synchronizing the Folded Line for a detailed explanation of how to do this successfully. 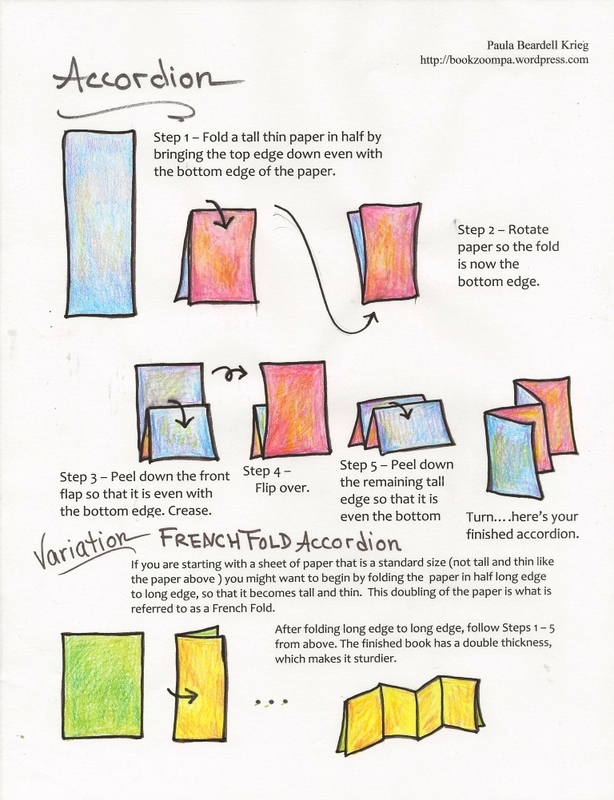 Fold up a few inches from the bottom edge: use your judgement to approximate the right amount, keeping in mind that you will also be folding this paper down from the top to match the height of your book. 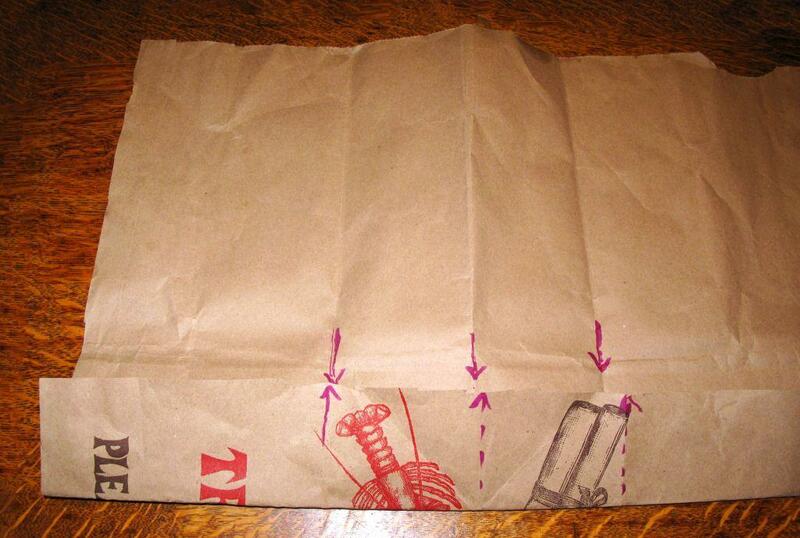 When you make your fold, be sure that the vertical folded lines of the grocery bag line up with each other. These folded flaps should make the height of this paper just a tad larger than the book that is to be covered. 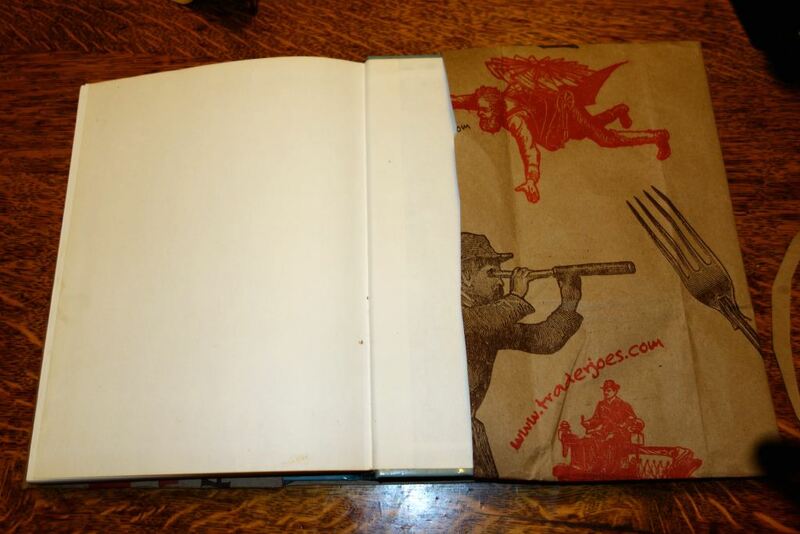 A little bit of wiggle room is need so that the cover of the book can slide into the folds. 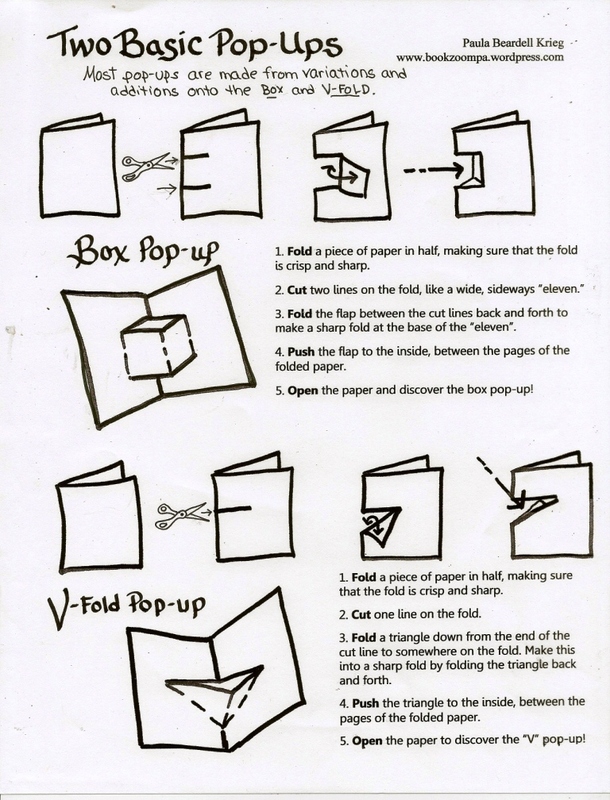 Fold in the side edge. 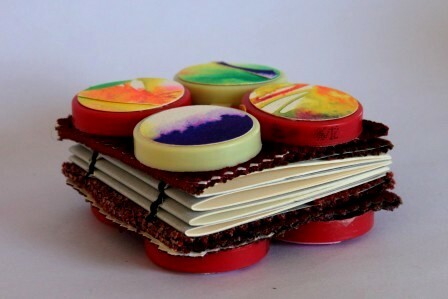 Just how much will depend on the width of the book. 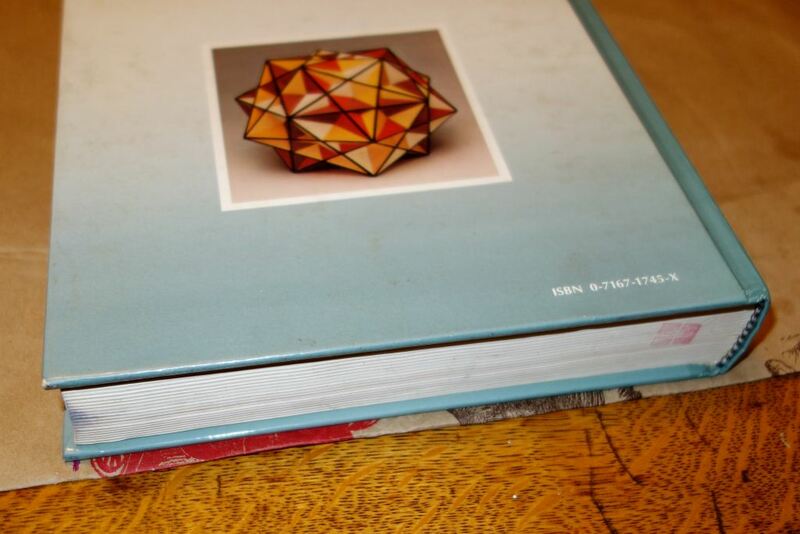 Here, I folded over 6 inches for my eight inch book. 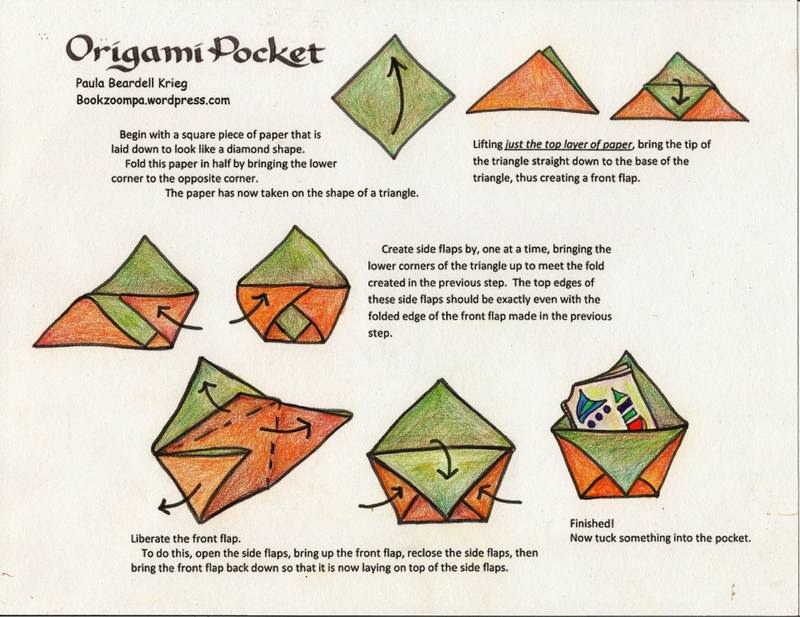 This fold creates a pocket. Slide the book all the way into the pocket. 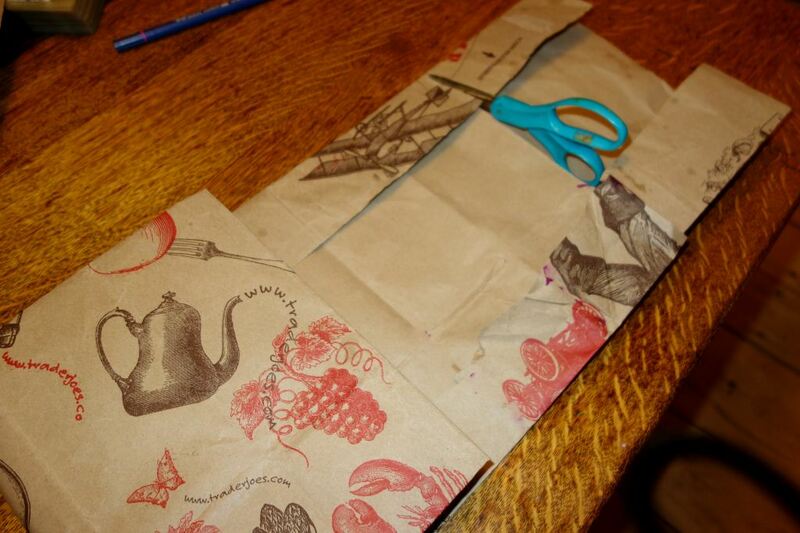 ….just cut off the excess, making sure that you leave enough to create the back pocket-flap. This looks like I still have too much excess. It’s better to err on the too much side than to the little side. You can go back later and trim more as needed. When this is done fold up the back cover to fit the book. 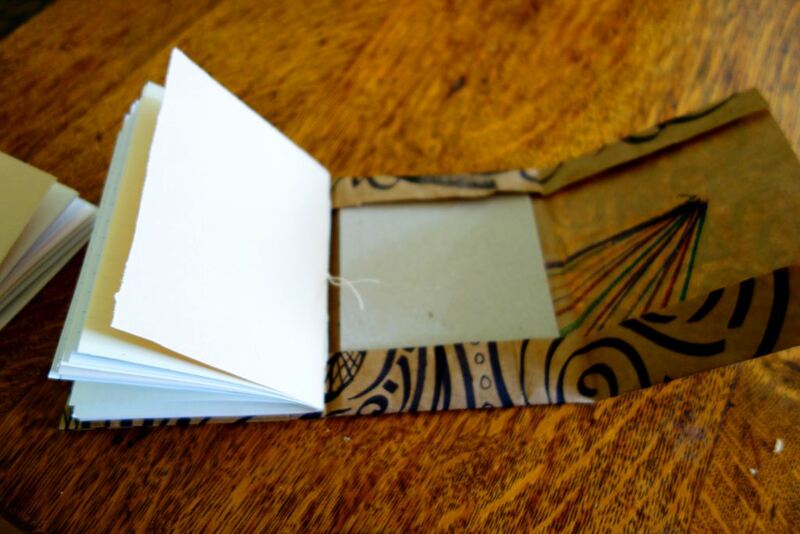 It’s really crucial to make the back flap a generously large pocket: as the book opens and closes it needs quite a bit of room to move around inside of this pocket. 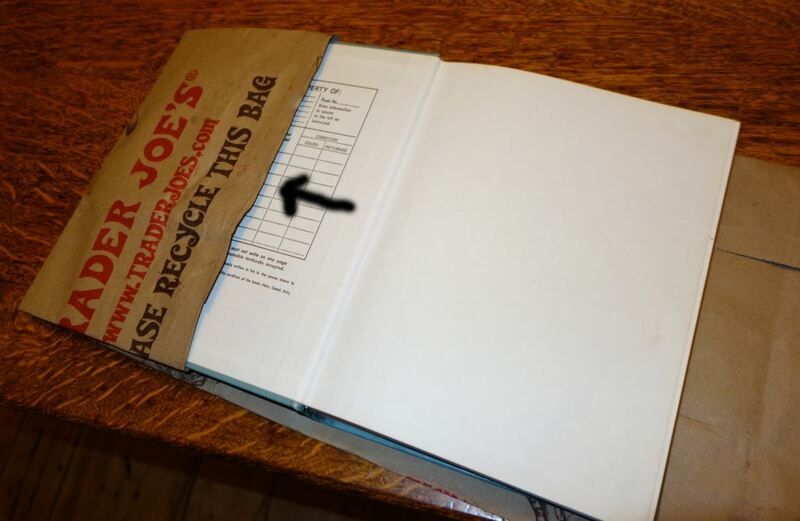 If the flap is too shallow the book will not stay in the cover. And here it is, covered! But what if you don’t have a textbook to cover? This is the bonus part. 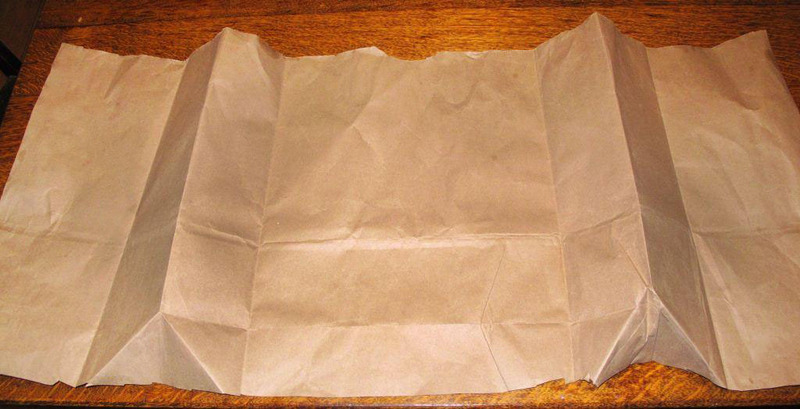 I have discovered that there’s nothing like a plain grocery bag to break down barriers of inhibition. Get out a black marker and just start making marks. Fill that paper. I do recommend using a thick black marker. I tried crayons and other markers, but nothing showed up as well as black marker. This was fun to do . I sewed a bunch of papers together (exactly 17) and then made a cover just like for the textbook. 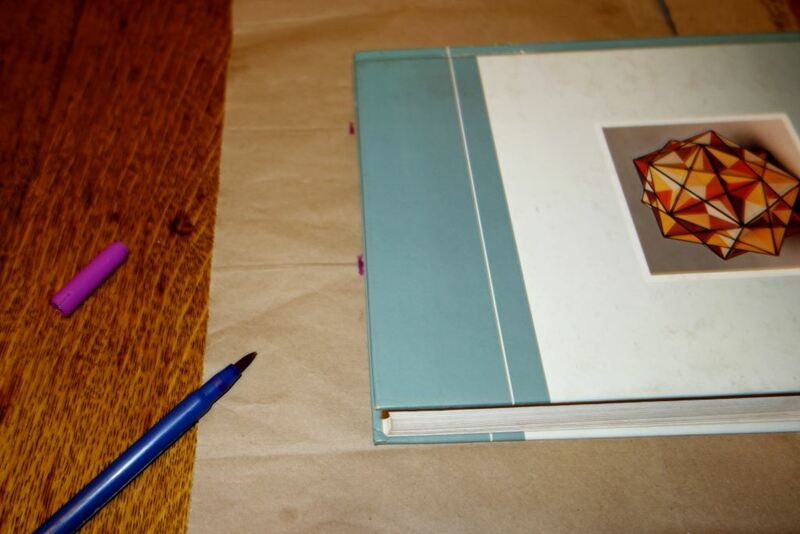 The only important additional step was to add a piece of cardboard into the front and back cover of the book (as shown above) so as to add weight and stiffness. 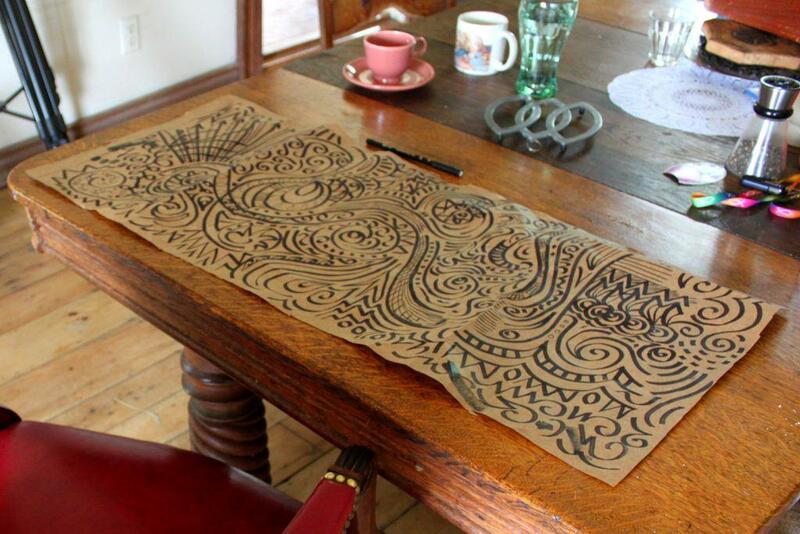 The board I used was from the back of a pad of paper. Cereal boxes work well, though sometimes it’s good to use a double thickness. I cut the boards (with scissors) the size of the folded paper. 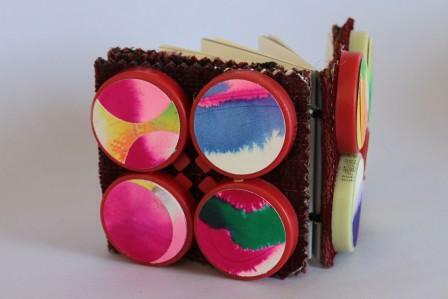 What’s great about these little books is that they don’t seem precious. I will be meeting up with some friends this week, and plan to gift these to the adults. The thing is, I don’t want the books to feel too precious to use, but I do want them to do be special. Making the book covers out of bags seems to fit all of my criteria. 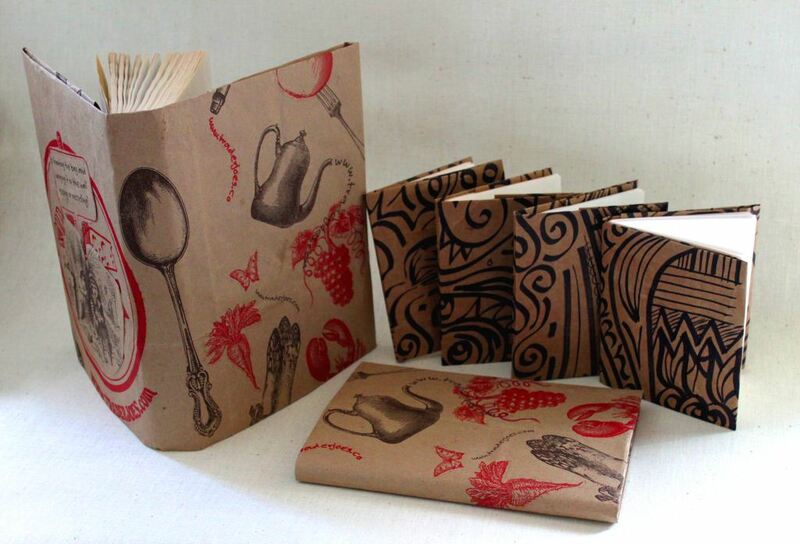 I recently had a hankering to locally source (scavenge) some materials to use to make a book. I have a bit of a collection of materials from a couple of fine local businesses. One is Blind Buck Interiors, a drapery and upholstery business, which has provided me with a many wallpaper and fabric sample books. 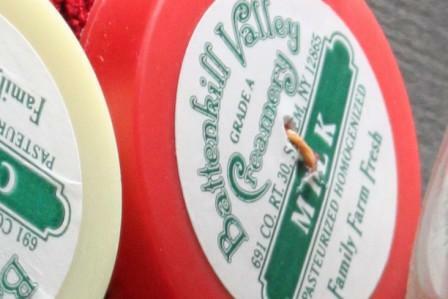 Another is the Battenkill Creamery, a dairy which has a dedicated herd from which they process their own milk right on the farm. 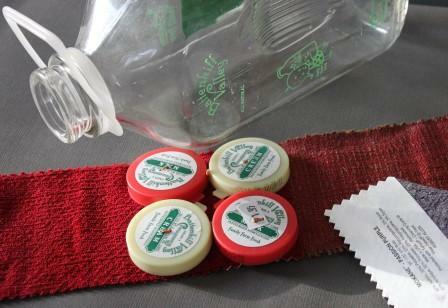 The milk can be bought in returnable glass bottles topped with a substantial plastic cap, which is not returnable. I have lots of caps. I took some milk caps and sewed them on to some upholstery samples. 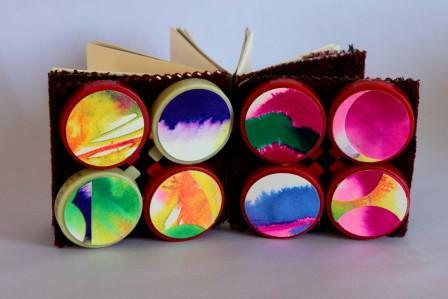 I started this project mostly because I had been admiring some circles that my daughter had been coloring in. 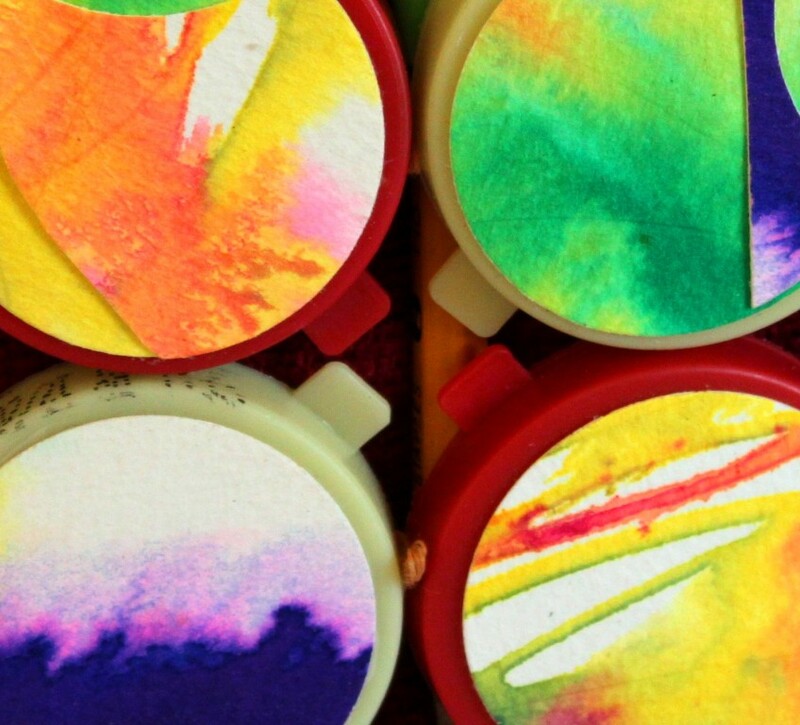 She had made a graphically lovely pages of colored in circles, and I wanted to do some colorful circles too. I had some leftover scraps of watercolor washes lying around, so I punched out some circles and glued them to the caps. I sewed in just a few signatures, using a simple butterfly stitch that I picked up from one of Keith Smith’s books. I used round shoe laces instead of thread, as the proportions seemed right and they were handy. One thing I like about making books is being able to use anything I feel like using to assemble a book. This little book stands alone in how it stands alone. It already has a new home, but while it was still here every time I saw it I felt happy. It just looks so silly and lovely.